With hundreds of customers through Arizona, the Signature Iron Doors team leads the state’s iron work industry. Our designers and technicians have serviced homes and businesses for decades and know what it takes to make a timeless structure. We have licensed welders and technicians along with a sales team who is on your side to make sure all your needs are fulfilled. 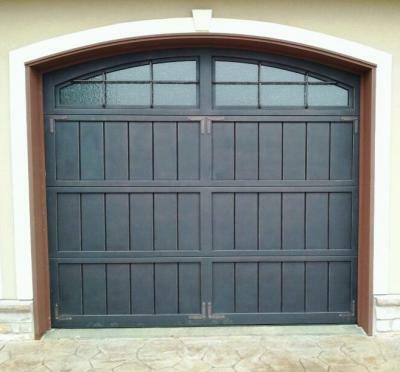 Signature iron Garage Doors have proven to be secure and durable, but not because they are immense or heavy. They are durable because they are made of 16” gauge steel and rolled for strength and durability. Our technicians have designed them to be durable and practical for home owner use in that any standard garage door opener will open and close them. These are images of Barcelona style doors done for some of our Phoenix Valley customers. Although scroll work is a beautiful feature among most of our popular doors, the Barcelona ranks in the top 10. 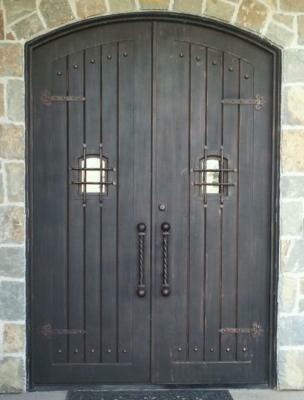 This design is all iron with a couple pieces of dual panned tempered glass, like all other doors, but the amount of iron with the small windows creates a secure and vintage feel to the home. Our largest showroom is in Phoenix Arizona. Please come visit us off of Southern and 40th st. Our sales team will gladly greet you and show you our in stock doors and all the styles we offer. You can see our different finishes and our glass samples and find out why Signature Iron Doors continues to grow as the Nation’s leading Iron work industry.